Micranthes rufidula (my-cranth-eez: small stamen; roo-fid-you-la: reddish). 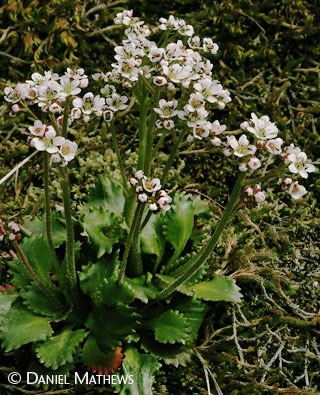 Synonyms: Saxifraga occidentalis, Saxifraga rufidula. Petals 5, ⅛” long [2–4 mm], oval with a distinct slender neck, white, without spots, sometimes becoming pink; 10 stamens with yellow to dark red anthers, slender (only slightly swollen) anthers; tiny calyx of 5 spreading lobes; pistil of 2 horns (rarely more); inflorescence flat-topped; leaves basal, tapering to flattened leafstalks 1½–3” long [4–8 cm], the blades oval to triangular, ½–1¾” long [12-40 mm], with tangled rusty brown hairs underneath, rather fleshy with coarse, even teeth, as if produced by a cookie cutter; flower stalks sticky-hairy, 2–8″ tall [8–20 cm], often reddening, leafless except for small bracts which, like the sepals, may or may not have rusty brown hairs. Habitat: Meadows and steep rocks that are moist or wet in spring, low to subalpine in coastal ranges of WA, OR, and sw BC. By waterfall creeks in the western Gorge and also around Catherine Creek in the eastern Gorge. OR and sw WA. 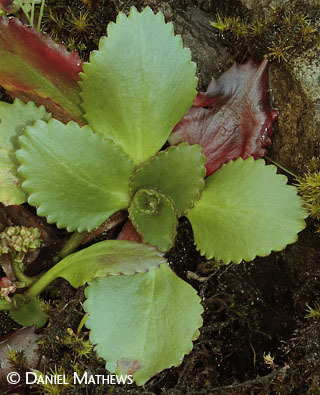 All 5 species are treated as varieties of Saxifraga occidentalis by some authorities. AlaskaSaxifrage, M. ferruginea, has 3 spotted petals distinctly wider than the other 2. 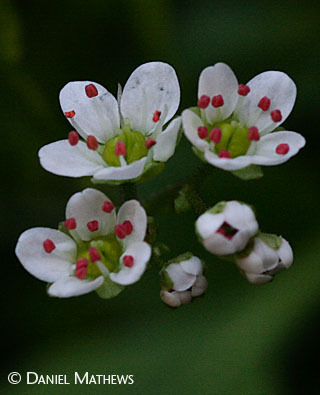 Natural History: Rusty-hair saxifrage petals, stamens, pistils, stalks, and leaves all commonly turn pink or red.